SKU: 04. Category: Micro Controllers. 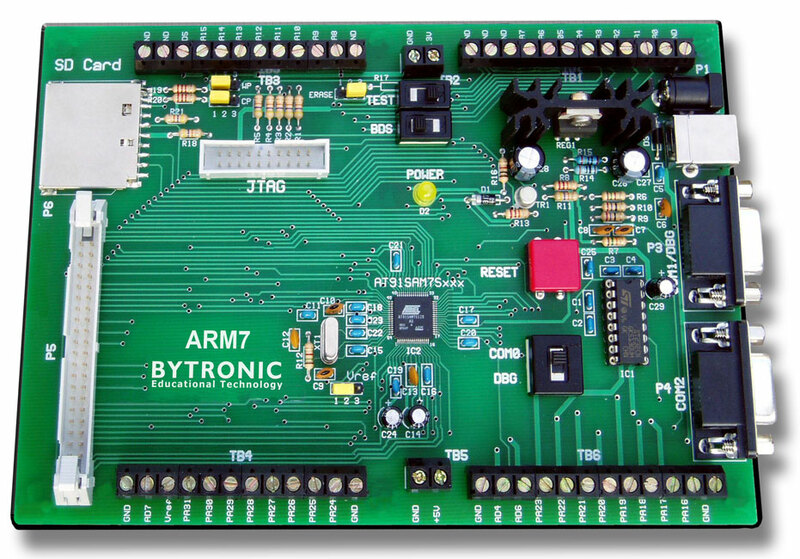 The ARM7TS consists of the ARM7 Microcontroller board fitted with the Atmel AT91SAM7S128, Crossware™ ARM7 “C” Software Development Suite, Jaguar™ JTAG, interface cables, power supply and training manual. The ARM7 Development Suite includes an advanced optimizing C compiler, Code Creation Wizards, source level instruction and peripheral simulator extendable to simulate complete target systems, source level debugger and the Crossware “Jaguar” JTAG to USB debugger interface. Software downloading to the target is possible by plugging the Jaguar into the JTAG connector on the ARM7 board and into a USB port on a PC. Programs are developed in ‘C’ or “C++”, debugged and then compiled before downloading them. Program download can also be achieved through either the 9 way D type, serial port connection or the USB port. A 40way IDC is fitted to the board and provides access to the controller ports and can be used for direct connection of additional application equipment. Access to the ports is also available through a screw terminal blocks allowing connection for demonstration or development purposes.